Sweeping new security measures are coming into effect in the United States to prevent future terror attacks. Every item of baggage passing through the country's 429 airports is planned to be electronically screened for explosives. The measures apply to both international and domestic flights. 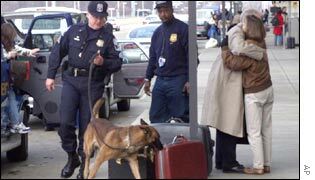 Airport security was severely criticised after the 11 September attacks when al-Qaeda members managed to board and hijack four planes from within the US. Americans will get their first experience of the new measures on New Year's Day. We still have people trying to bring guns on airplanes - what's wrong with them? International flights entering the country will have their baggage checked at their first landing point, even if the final destination is elsewhere. Experts reckon the new regulations will mean that 10% of luggage is opened and searched by hand. The BBC's Nick Childs in Washington says this may be one of the most significant new layers of security introduced so far at American airports. But there are worries the new security measures will cause delays and raise concerns about invasion of privacy. Previously only 5% of the luggage at American airports was screened. "It's not our intention to produce chaos," the Transportation Security Administration (TSA) representative Heather Rosenker told AFP news agency. "We're doing it because some awful people did some awful things on September 11, 2001, and because we want people to keep flying," she added. "We still have people trying to bring guns on airplanes. What's wrong with them?" she said. More than one billion items of luggage pass through US airports each year. The cost in new scanning equipment is estimated at over $1.3bn. Not all airports have the new system yet. The authorities say sniffer dogs, hand searches and checks against passenger lists will fill in the gaps. According to our correspondent, the new measures will result in delays but America's travelling public looks ready to pay the price. Q&A: Will increased US airport security work?